"Practical strategies and useful advice delivered with clarity and empathy by a respected expert in the field of learning disabilities." -Nancy Samalin, author of Loving Each One Best and Loving Your Child Is Not Enough. "A wonderful glance into the world of learning disabilities and ADHD. Highly informative, addressing social and behavioral issues with sensitivity and compassion." -Anne Ford, Chairman of the Board, National Center for Learning Disabilities. In this reassuring book, noted psychologist Betty B. Osman offers expert guidance and insight to help you help your child. Her unique approach addresses not only school issues, but also focuses on social interactions with peers and family. 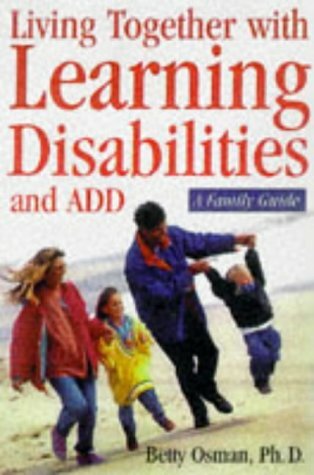 A completely revised and expanded edition of the classic Learning Disabilities: A Family Affair, this guide provides vital information on: Early signs and symptoms of learning disabilities and Attention Deficit/Hyperactivity Disorder (ADHD). The latest advances in educational, medical, and psychological treatments-including drug and behavior therapies How learning problems affect the whole family. Helping your child prosper-both in and out of school. About Betty B Osman (Author) : Betty B Osman is a published author. Published credits of Betty B Osman include Learning Disabilities and ADHD : A Family Guide to Living and Learning Together, No One to Play With.